You are looking for flooring that is tough enough to take on the elements, yet attractive enough to beautify your home. Our flooring experts recommend waterproof flooring in Allen, TX. Come into our well-organized showroom to discover hard and soft flooring surfaces that are made to withstand water. We offer customers a huge selection of all types of flooring that are as stylish as they are functional. Our flooring specialists have extensive product knowledge, as well as design training, to help you select the right flooring for your home or business. Ask our sales and design professionals about our new waterproof floors that stand up to water and win. It is our job to find you flooring that meets your lifestyle requirements and design preferences. We are dedicated to satisfying our customers and are excited to offer you more versatile choices than ever before. Our stylish collections of waterproof luxury vinyl flooring and carpeting are sure to meet your expectations and live up to your high standards. If your household includes children and pets you may be used to water and other liquids spilling on the floor. Or maybe you entertain a lot. Beverages and food can slip from your guests’ hands and land on your flooring. Let us help you select flooring that allows children to be kids and pets to be no trouble so you do not have to stress. Downs H2O - This popular manufacturer offers a selection of luxury vinyl tile and plank floor coverings that are guaranteed to be 100 percent waterproof. Neither liquids from drinks or your sink, nor accidents from cats and dogs, can destroy this flooring. All you have to do is wipe up the spill for flooring that looks perfect. 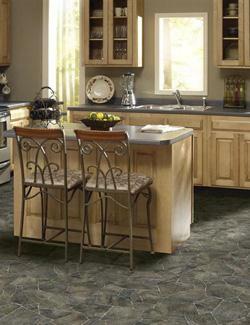 To go along with the durability, you have the authentic appeal of ceramic tile or hardwood flooring. COREtec - So confident is this manufacturer about its patented engineered flooring that it offers a limited lifetime guarantee. COREtec realistically mimics hardwood or vinyl and is built to be 100 percent waterproof. Its layered construction allows for installation versatility as it can be used in wet areas of the house and does not swell when exposed to water. Rocaille - The name for this gorgeous high-end flooring comes from the Rococo style of the Baroque era of France. This was a period in time when an interest in nature and natural science was expressed in art and inventions. That is why it is the perfect name for flooring that combines the glory of real wood with advanced engineering to produce waterproofing flooring of charm and grace. Tigressa - Yes, you can have soft flooring that resists spills and stains when you choose Tigressa H2O carpeting. This waterproof carpet is soft, strong, green, and waterproof. The secret is an exclusive backing that keeps liquids from soaking through the carpeting and ruining it. Contact us today information about our hard and soft surface waterproof flooring. We proudly serve customers from Allen, Plano, McKinney, Frisco, and Parker, Texas, and the surrounding areas.